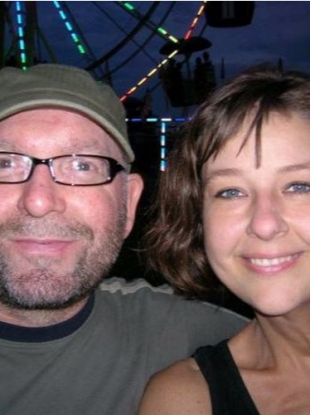 A MARRIED COUPLE who ended up both fighting cancer in different continents at the same time have described how they are now back living together and are ”learning how to live again”. John, from Thurles in Tipperary, and Tracey, from north Carolina, met online in 2003 – before dating sites were common. Tracey told The Ryan Tubridy Show on RTÉ Radio 1 how the pair started talking in a chatroom called 35 plus divorcee “when it was not cool to meet online”. John described how, “It went from there to talking on the phone. Racking up huge phone bills in the days before messenger and Skype. Then one day after a couple of months she demanded that I get on a plane and go over and see her. Describing their first kiss at the airport, John said, “We never looked back from that”. She’s the most wonderful woman I’ve ever met. Her smile, her eyes, her personality. She’s just absolutely wonderful. The pair travelled to and from the US and Ireland to see each other before getting married at Christmas 2008 and John moving over to the US. In 1991, John had received a kidney transplant after being on dialysis for a year and a half. It lasted 24 years but started to decline soon after he got married. He said he always knew he would have to return to Ireland for treatment. After getting sick with an unrelated illness at the end of 2014 and spending time in hospital in the US, John came back to Ireland in February of 2015. The couple had planned to start a new life in Ireland and sold all their possessions and made all the appropriate arrangements in the US. Tracey stayed back a little longer as she had a thyroid operation scheduled for June but had planned to return to Ireland in July. Tracey found out she had breast cancer and had a double mastectomy but after that they also discovered she had a brain tumour. John was also unwell back in Ireland and was in the process of getting on the list for another transplant. After returning from a visit to the US, he started to feel very unwell and he was diagnosed with life threatening anemia before a bleeding tumour was discovered in his bowel. To go through it and to be apart from each other at the same time just made it unreal, it was extremely difficult. Tracey added, “We literally talked or video chatted every single day and because we were going through the same things we were each other’s biggest support. “When he was having his down in the pit moment I could help bring him up, and when I was having mine, he could help bring me up. Just being best friends and knowing you have that one person who will be there to the nth degree, and he was, and we were that for each other. The couple are now both in remission and John is back on dialysis. Tracey has now moved to Ireland and they described how they “just try to live and have hope that it’s going to be okay”. Email “Couple who battled cancer at the same time in different continents 'glad everyday they get up' ”. Feedback on “Couple who battled cancer at the same time in different continents 'glad everyday they get up' ”.